Collaboration scripts aim to facilitate effective interaction patterns for collaborative learning that do not occur spontaneously. So far, diverse non-generic scripts have been conceptualized and investigated in CSCL environments. The specification of collaboration scripts aims to provide a common terminolgy for describing scripts and to abstract the core design principles of scripts to better understand effects and mechanisms of collaboration scripts and to apply and re-apply collaboration scripts in different learning environments. Beginning with a review of the original conception of scripts for collaborative learning and its evolution in context of CSCL, we present recent approaches towards a specification of scripts by Dillenbourg (2002), Dillenbourg and Jermann (in press) and Kollar, Fischer and Hesse (in press). The framework that we propose here can be regarded as an expanded and revised consolidation of these efforts. We then discuss the kind of activities that the instructional approach of scripting collaboration aims to foster. Our paper subsequently presents the components and mechanisms that constitute a script and illustrates them with example scripts. 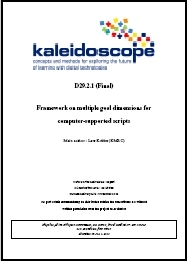 We finally give an outlook on the future task of formalizing scripts and conclude with a brief evaluation of the framework. Nevertheless, we believe that a semi-formal script description is more than just a transitional step in the formalization process and has a value of its own: Many researchers and practitioners (even in the field of technology enhanced learning) may not find themselves at ease with reading formal, computational languages, let alone applying this formalism to write down scripts they have designed themselves. Thus, the semi-formal description may serve as an intermediate representation that bridges the gap between very different affordances.